Being a customer focused organization, we are engaged in providing our valued patrons Battery Maintenance Services. The rendered service is carried under the strict vigilance of deft professionals, who are having years of experience in this domain. Apart from this, we strive to offer this service so that we can offer our esteemed clients complete satisfaction. In addition to this, we offer this product to our client in client-friendly rates. We are mainly provide the high quality with wide range of Battery Maintenance Services. We offer an extensive line of automotive, light truck, heavy duty, marine, lawn & garden, golf cart and power sport batteries with sizes and power levels for all of your automotive, commercial and recreational needs. Keep the car engine in good condition by performing regular maintenance. Tune up and change the oil regularly. Periodically check the radiator fluids to keep the engine from overheating. Watch for terminal corrosion on the battery and make sure all connections are clean and tight. Ask your technician to test your battery. This type of test can be performed quickly by most automotive service centers. Ideally, park the car in a shady spot or in a garage, protecting the battery from damaging heat. If the car is difficult to start, have the vehicle's electrical system checked, and if any component is marginal, it's probably time to get a replacement component. This type of test can be performed quickly by most automotive service centers. 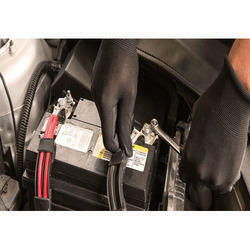 Looking for Battery Maintenance Services ?